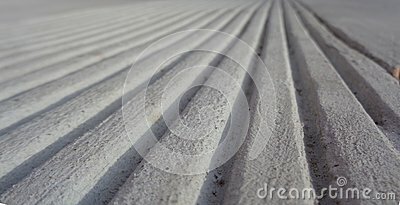 The image shows parallel lines in concrete. There is interest of texture, light and shadow. It shows perspective in parallel lines which direct the eye off to a horizon. It is a monochromatic composition in shades of warm white and grey. The concrete has a rough sandy texture. It could be used as a background or screensaver. There is room for use of text. Incidentally this composition also futures an optical illusion that the wide strips are elevated to alternately the dark strips appears as raised ridges.